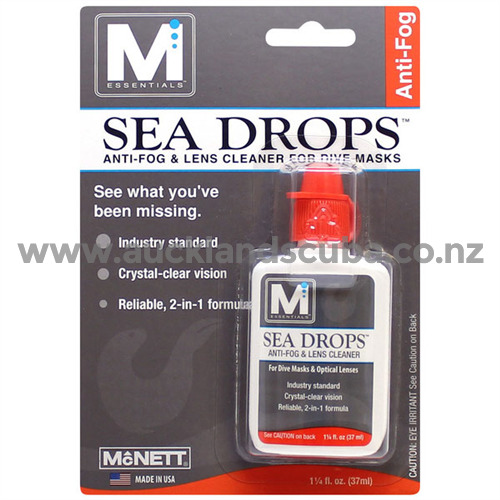 McNett's Sea Drops Anti-Fog & Lens Cleaner is Safe for All Glass and Plastic Lenses. Sea Drops will not harm surrounding Silicone or Rubber Support Frames. Sea Drops are designed for Maximum Dive Mask Defogging and Quick, Easy, In-Field Application. Sea Drops are also excellent for Ski Goggles, Eye Glasses, Face Masks, Binoculars and Telescopes. Not recommended for swim goggles. For Swim Goggles see SKU: AQUSQAF Sea Quick Anti-Fog Spray. Sea Drops is a 2-in-1 Formula that not only provides Anti-Fog Benefits, it also Cleans the Lens Surface every time you apply it. Sea Drops is Proven to Last Long, is Concentrated, so you only need to use a little and Non-Abrasive so its Safe for All Lenses and Optics. Sea Drops Performs well in Extremely Cold Water and is Non-Toxic, Biodegradable and Alcohol-Free.